Soya Manchurian is a delicious fusion dish with Chinese and Indian flavours entwined to tantalize your taste buds!! The rich in protein Soya Bean Chunks are acclaimed worldwide for its health benefits. It is a great source of vitamins, minerals, iron, calcium, fibre and proteins essential for growing kids. Supplemented with Omega -3 fatty acids, it also improves cardiovascular health. Soya comes in many forms like chunks, granules, nuggets etc. and it is also known as the meat for vegetarians. For me, Soya time is mostly during the Lenten days, when I look for variety vegetable options to amplify my menu. 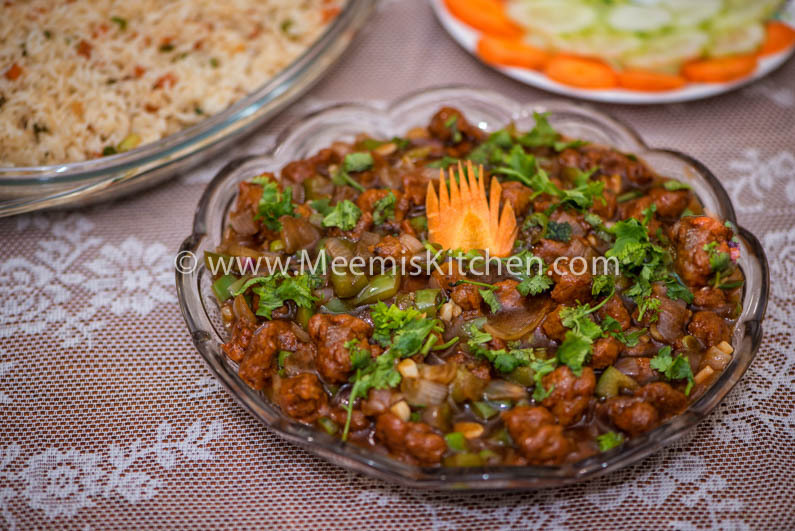 Soya Manchurian idea is something I got from a vegetarian friend of mine, Preetha, a very inventive cook. To be honest, I was skeptical about cooking Soya chunks in Manchurian style, as I always found it a hard job, to make Soya appealing in any way. Well, inspired by Preetha, I tried it and Soya Manchurian was really awesome and got many compliments. So, try this yummy Soya Manchurian recipe and have it hot with fried rice, noodles, Naan or rotis. You will love this like my other Indo Chinese special recipes like Gobi Manchurian, Honey chicken, Ginger Chicken, Chilli Fish, Chilli Pork, Paneer Chili etc.! Also, try my Soya cutlets recipe, a great starter and healthy snack. It can be had dry or with little gravy as per your liking. This recipe is for making Soya Manchurian semi – gravy style. Enjoy!! Wash and soak Soya Chunks in hot water and salt for 10 -15 minutes. Rinse in cold water, squeeze and keep aside. Grind the onion, tomato, garlic, chili powder, masala and salt. Marinate the soy balls. Add Maida and corn flour and mix well (don’t add water). Deep fry this soya balls in Oil till slightly brown. Set aside. Remove excess oil from the pan, and keep enough oil for sautéing. Add the finely chopped garlic, Sauté for 1 minute, add ginger and stir fry for few seconds, add finely chopped green chili and then cubed onion. Once the onion becomes pale, add chilli powder, pepper powder and sauté. Add cubed capsicum after. Sauté for few seconds. Add the chopped spring onions and celery (optional). 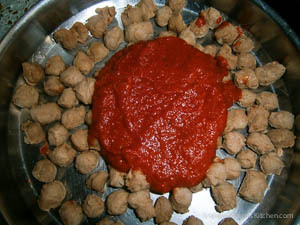 In a bowl, combine the Soy sauce,Tomato sauce, vinegar and half cup water. Add this to the pan and let it simmer. Adjust the salt and taste. 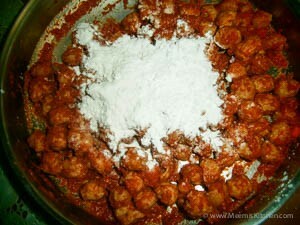 Mix corn flour in 1/4 cup of water and pour into gravy. Stir well till the gravy thickens. Add fried soya Balls and stir for few seconds. Garnish with chopped coriander leaves/ spring onion. Transfer to a serving plate. Enjoy!! If you like it dry, don’t add vinegar, water and cornflour. Just add the sauces and combine the fried Soya balls. Add more green chilies or pepper if you like it spicy. You can try adding little vinegar (½ tsp) if you like it tangy. Soya is a recommended food for children as it is rich in amino acids that produce proteins essential for their muscle growth. It is rich in Iron and calcium too, great for growing kids, expectant mothers, elderly, and heart/ diabetic patients. It provides a good supply of Omega -3 fatty acids for improved cardio vascular health.